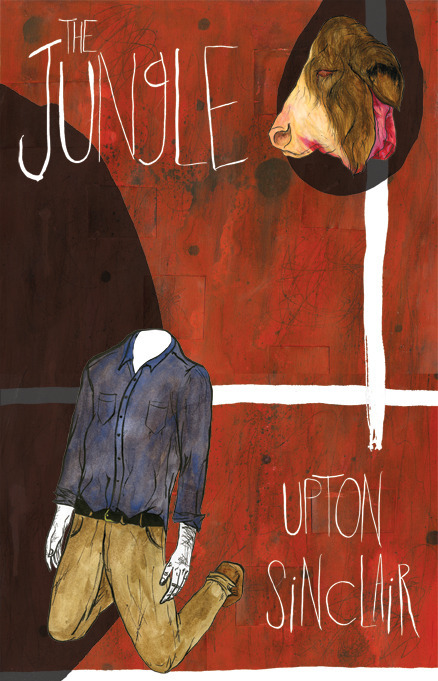 The Jungle, by Upton Sinclair, is a classic of American literature. It's one of those books (like Animal Farm) that you feel like you know even before you read it and therefore you don't have to read it. The Jungle takes place in Chicago, which is one of the main reasons I wanted to cross it off my list of classics to read. It was serendipity that I read it so soon after My Year of Meats because I think My Year of Meats references The Jungle in many ways. Both books are ostensibly about the meat industry, but they use the industry to bring much-needed attention to societal problems such as the plight of the poor or the dangers of animal hormones. The Jungle was not a particularly entertaining read. It was, like My Year of Meats, more of a diatribe or lecture nestled into a novel. The Jungle was even more depressing, though, because there was NO REAL HAPPINESS in it ANYWHERE. It centers on an immigrant man who becomes a worker in the Chicago stockyards (saying things like "I will work harder," a quote George Orwell used in Animal Farm to promote socialism) and then loses everything after he gets injured and then gets in a fight. But luckily, there are communists! And they save him. It is a LONG HAUL before we get to the happy communist comrades, though. Lots of gross meat-packing horrors, lots of time spent in jail, lots of struggling on the streets of Chicago, lots of despair and death. It is possible that the writing was really great, but if so, it was lost on me through the grind of depressing events. It was never-ending. That said, I am glad that I read The Jungle. Not only because it made me feel better about my own life, but because it also was such an important book in American history. An important law about meat purity was passed after President Roosevelt read the book (hopefully the industry still follows that law, though there are probably many more that are worthy of being passed now). So reading The Jungle made me realize that books really can have a huge impact on the world and create positive momentum (even when they are so depressing). So - yay! I don't know if I can read this one -- I enjoyed My Year of Meats because of the fictional narrative, not sure I can do a non-fiction book abt the meat industry! Oh, this is fictional, too! I read this one many years ago, and I remember thinking it was really good, but also really depressing. Made me not want to eat meat for awhile, that's for sure! Enjoyed this review because you pegged the emotional response to this book so perfectly. I didn't "like" it either but thought it was important to read. Just damn depressing. It's really hard sometimes to review those books that are important but not personally engaging. Still, there should be a saint's list or something for books and movies that were direct influences on change of policy, or similar change for the better. I have this one on my "to be read" trolley at work. It was recommended as being similar to The Dollmaker by Arnow in general tone. And I love and adore that book so I really must try this one at some point. Kim and I read this one for our now-defunct BookClubSandwich reading group. Sadly, I flaked out. I may try it again one day when I'm braced for a long haul.